With the cost of fresh vegetables and fruits on the rise there is a terrible assumption that canned and frozen are inferior to fresh fruits and veggies in both taste and nutrition. We live in, arguably, the best country in the world; Canada, home to majestic landscapes, multiculturalism and the friendliest people, eh? But Canada is also known for…winter. December to March brings the coldest temperatures making it difficult to grow fresh fruits and veggies, even for the mildest parts of BC. In the middle of February, when I am longing for juicy, ripe peaches I skip the produce aisle and head straight to the canned section in the grocery store. I know the canned variety of peaches (packed in water or juice) will satisfy my craving far better than any peach flown in from a country, far, far away. Likewise, I love making stews, curries and lasagnas during the winter months and for these nothing beats canned tomatoes (low sodium). They’re cheap and easy to use so when they go on sale, I buy a case. Canned and frozen fruits and veggies are picked at their prime, locking in their flavour and nutrients. Better yet, they are often cheaper than the fresh variety especially if the fresh variety is flown in from around the globe. Lastly, they last! When you pick up a bag of frozen blueberries you don’t have to worry about whether you’ll eat them before they go bad. Frozen and canned fruits and veggies can last up to one year (be sure to check the expiry date). 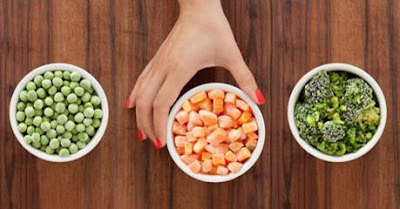 So as we enter the coldest months, consider these tips and tricks to use more frozen and canned fruits and veggies; another way to help you meet Canada’s Food Guide recommended daily servings. Making frozen and canned produce a regular part of meals and snacks is a great way to stay healthy all year long. Natalie Laframboise. Natalie supports healthy eating policy and programs in her role at the Ministry of Health as the Senior Policy Analyst. When she is not at work, Natalie is also completing a master’s degree in foods and nutrition.